Eleven months to the day (pretty much), my workbench is finished! The bench is a split-top Roubo style made with construction-grade southern yellow pine. It has a leg vise and tail vise (hardware from Lee Valley). The storage platform has a cabinet to house my planes (and keep them free of dust). The middle divider doubles as a planing stop and has spaces for holding tools. Fully loaded the thing weighs probably 250 lbs and is rock solid. I began work on the bench during Christmastime 2012. Having little time for woodworking (and also having my workshop 1.5 hours away), I have been working on it piecemeal in the interim time. 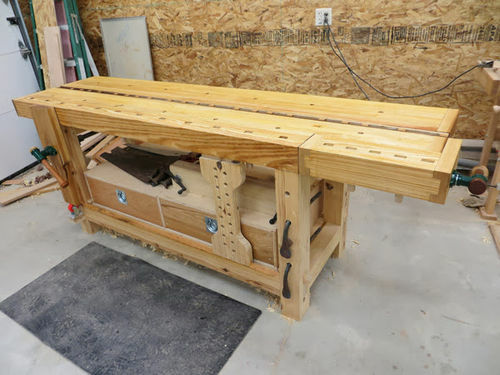 However, in between deer hunting over Thanksgiving week, I finally got time to finish the few small remaining tasks to get the bench to the “complete” state. Of course, there will undoubtedly be changes made over time as my style of work progresses. For now though, the top is flat, BLO is applied, and it’s as pretty as it’ll ever be. Thanks for looking! I will be updating my blog with a SketchUp model sometime soon for anyone that’s interested. But of course, the bench isn’t done until I take a picture with the Bondo Pose! One bench per year seems to be quite reasonable rate (according to my own experience). Friggin Awesome! Well done on the bench and the Bondo pose. I really need a real workbench!!! Great looking bench. I have the same tail vise from Lee Valley, yet to be installed on my yet to be built bench. I do however have a large stack of rough birch waiting for the first cut. Any tips on building the tail vise? 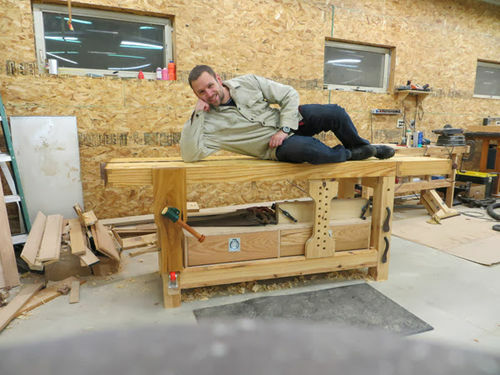 @rad457 – I did a blog post on making my tail vise. I can’t say that my way is the best way, but it worked for me. The best advise I can give is to make sure things are square before you start assembling as it will save you headaches later on. 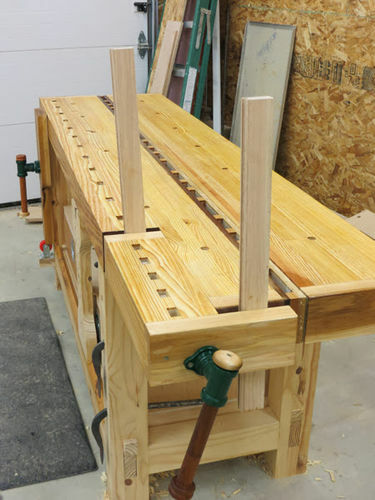 Great job – really like the tail vise. Looks like it should last you quite a while… Nice Bondo pose! Beauty! Favorited and I’ll be checking out that blog and sketchup when it comes time for me to make a new bench. Nice work. Congrats on fine looking bench. Proud owner/builder and top bench poser, all three in one .So very well done and a smashing looking bench too. I finished mine about six months ago so will need to post pics soon LOL .